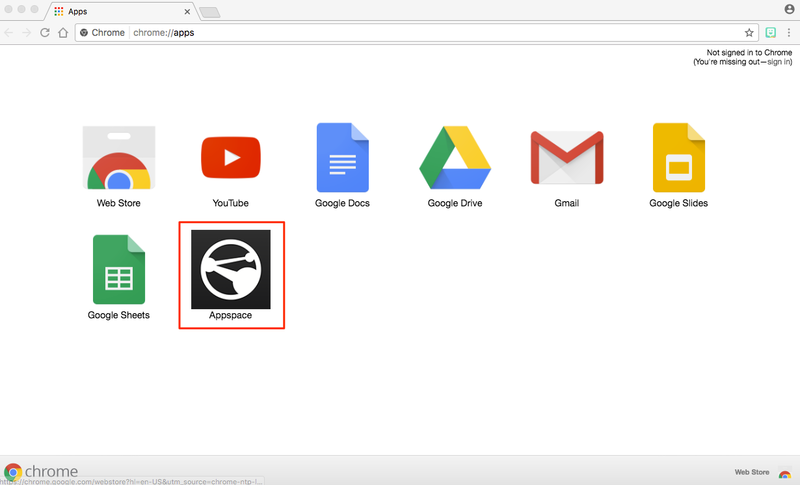 This article provides instructions to configure and register Chrome OS based devices with the Appspace App. A USB keyboard for activation. Launch the Google Chrome web browser on your device. Click the following link to select the Appspace App on the Chrome Web Store: https://chrome.google.com/webstore/detail/appspace/gmdgbdlpbnhiogedlhmdiceocbgcbpgi?hl=en. 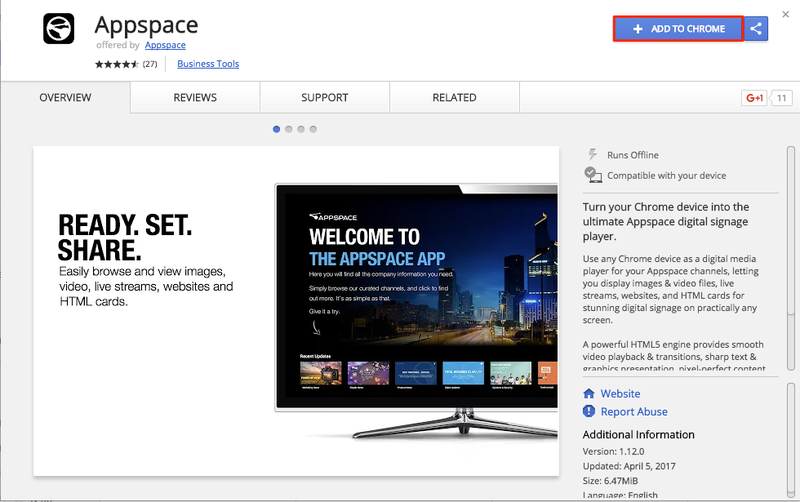 Once installed, the Appspace App is visible in the Chrome App Launcher. You must upgrade the Appspace App to version 1.27 (and later) for this feature to work. We recommend Chrome based devices be pinned to Chrome OS 64, for Appspace App to work seamlessly. If you are running Chrome v63 and below, the Appspace App will trigger an upgrade to Chrome v61. If you are running Chrome v64, the Appspace App will keep Chrome at that version until Appspace verifies the next stable version. If you are running Chrome v65, the Appspace App will hold at this version as there is a technical limitation that results in no display/video playing after reboot. It is not possible to automate a rollback of Chrome. However we have several workarounds listed in the Appspace App 1.36 Release Notes. You must have Google Admin credentials with a G Suite (Google Apps) account. 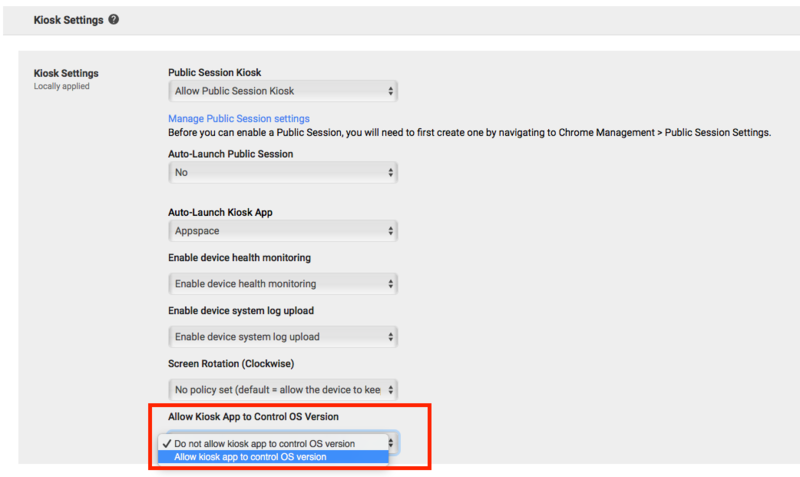 Navigate to Device settings as per the Manage Chrome device settings article: https://support.google.com/chrome/a/answer/1375678?hl=en. 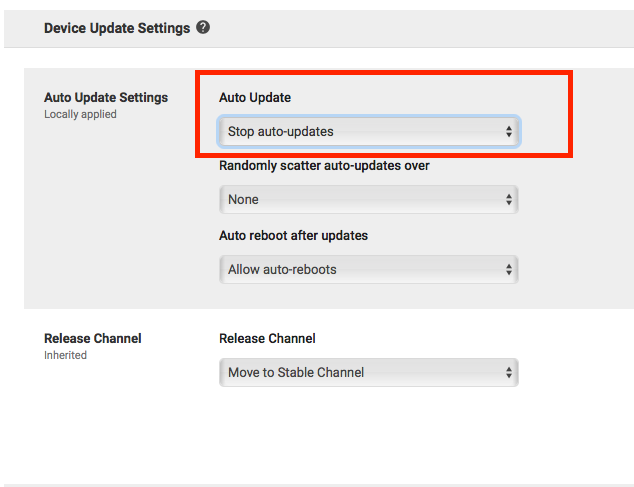 To disable auto-updates, navigate to Device Update Settings, and select Stop auto-updates in the Auto Update drop-down menu. To allow Appspace App to control the OS version, navigate to Kiosk Settings, and select Allow kiosk app to control OS version from the Allow Kiosk App to Control OS Version drop-down menu. Confirm and verify your selection. To uninstall the Appspace App from device, follow the instructions in the Uninstall an extension section in the following article: https://support.google.com/chrome_webstore/answer/2664769?hl=en.